I am far from the only American Anglo in Israel who will be celebrating Thanksgiving on November 23. Cooking a full turkey-and-stuffing feast remains a popular custom for thousands of U.S. transplants living in Israel. Proud Israelis all year-round, we still find a comforting familiarity in the quintessential American holiday and, come late November, busy ourselves baking apple pies and pumpkin-spiced little somethings. So, this time of year, it is to an American chef that I will turn to for inspiration. 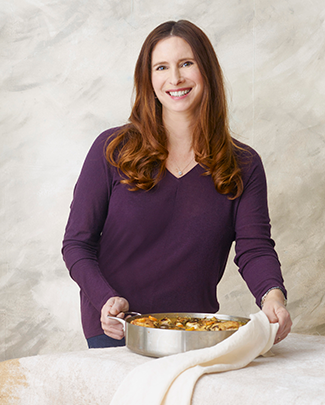 Paula Shoyer, dubbed The Kosher Baker for her string of successful Jewish baking cookbooks, offers several healthy tweaks to hearty fall classics in her new cookbook, The Healthy Jewish Kitchen . This new recipe collection is a mix of several culinary influences: riffs on traditional Ashkenazi staples (tzimmes purée, blueberry honey cake scones); vibrant Israeli salads and Moroccan spiced soups; and Asian as well as more exotic global flavors derived from Shoyer’s personal travels. This melding of flavors and foodways embody the modern Jewish experience, in which global accessibility has broadened our palates beyond Ashkenazi/Sephardi/Yemenite, etc. One may not consider Hawaiian poke to be a Jewish dish, but when served as a refreshing alternative to gefilte fish on your holiday table, as Shoyer suggests, it suddenly takes on a new role. With turkey still front-and-center to my meal planning, Shoyer’s Healthy Jewish Kitchen had ideas to modernize, globalize and make the rest of my dishes more nutritious, from a starter of Rosemary Focaccia to Sage and Shallot Roast Turkey with Whole Wheat Stuffing and Apple, Squash and Brussels Spout Salad. From my family in Israel to yours in America—or wherever you are celebrating this year—happy Thanksgiving. Place 3 cups of the all-purpose flour, whole-wheat flour, water and yeast in the bowl of a stand mixer with a dough hook attachment and combine, then continue for 1 minute more, or mix by hand. The mixture will be sticky. Cover the bowl with plastic wrap and let the dough rise for 1 hour. Add the salt to the dough, and mix with the hook attachment for 5 minutes. Place 1 tablespoon of all-purpose flour on the counter. Turn the dough out onto the counter and coat both sides with the flour. Knead the dough a few times, adding 1 or 2 tablespoons of flour if the dough is very sticky. Grease the bowl with a little oil and place the dough back into the bowl. Cover it with plastic wrap and let the dough rise for another hour. Place 1/3 cup of the olive oil on a jelly roll pan (the pan you use must have sides). Place the dough on top and press and stretch it toward the corners of the pan as best as you can, without getting oil on yourself. Cover the pan loosely with plastic wrap and let the dough rise for 10 minutes. Every few minutes, press on top of the plastic wrap to stretch the dough into the corners, without causing the oil to tsunami over the sides of the pan, and lift the plastic so it does not stick to the dough. Preheat the oven to 450°. Remove the plastic wrap and use the end of a wooden spoon to poke holes in the dough, about every 2 inches. 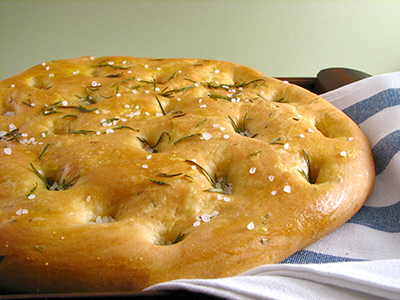 Drizzle the remaining 2 tablespoons of olive oil on top of the dough. Sprinkle it with kosher salt and chopped rosemary. Bake the bread for 25 minutes. As soon as it is cool enough to handle, slice it and start eating. Turkey breast serves 6; stuffing serves 10. Note: If you are making a whole turkey, double the rub ingredients. To prepare the stuffing, heat the oil over medium-high heat in a large frying pan or wide saucepan. Add the onions, shallots and celery and cook for 10 to 12 minutes, or until vegetables are soft. When the vegetables for the stuffing are soft, add the apple, thyme and sage and cook the mixture for another 3 minutes. Add the bread cubes and cranberries and toss well. Cook for 2 minutes while still mixing. Add the wine, water or stock, salt and pepper and stir and cook the mixture for another 2 minutes. It can be made 1 day in advance and stored in the fridge. After the turkey has browned, turn the oven down to 325° and roast the turkey for another hour, or until the juices run clear and a thermometer reads 160°. Place the stuffing into a 9 x 13-inch baking pan, cover it with aluminum foil, and bake it at the same time as the turkey, on another rack in the oven, or separately, later on, for 45 minutes to 1 hour. If you’re roasting a whole turkey, roast it for 15 minutes per pound, or until the juices run clear. You can also test doneness by jiggling one of the turkey legs: If it comes away easily from the side of the bird, it’s done. Using meat forks, transfer the turkey to a platter or cutting board and let it rest 15 to 20 minutes before carving. To make the gravy, add 1/2 cup hot water to the roasting pan, stir it into the pan juices using a silicone spatula, and then strain it through a sieve into a bowl or gravy boat. Reheat if necessary. 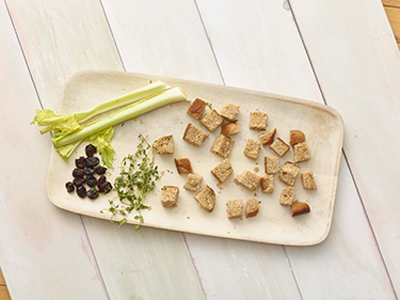 Serve the turkey hot with stuffing and gravy, or cold in salads and sandwiches. Preheat oven to 400°. 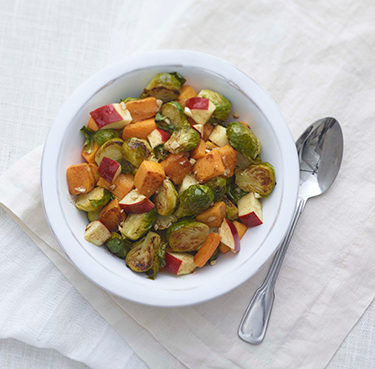 Place the prepared Brussels sprouts on one side of a jelly roll or roasting pan and toss with 1 tablespoon of oil. Place the butternut squash cubes on the other side of the pan and toss with 2 teaspoons oil. Roast for 30 minutes, or until fork-tender. Let vegetables cool. Place the roasted vegetables into a large serving bowl. In a small bowl, whisk together the remaining 2 tablespoons oil and the maple syrup, garlic, rice vinegar, allspice, cinnamon and water. Pour over the vegetables and toss well. Add the apple pieces and toss again. Add salt and pepper. Serve at room temperature.